Google Chrome is the most popular browser and leading the market share in style with a lot of features and functionality. One of the main reason behind the Chrome’s success is the huge amount of chrome Extensions that can be installed from the Google Web store easily. Google has customized The New tab Page of its browser and offers the most visited websites and chrome apps in that page. However, if you want to customize the new Tab page of Chrome of your own choice, you can do it with the help of vast collections New Tab Page Google Chrome Extensions. Previously, We have shared the plenty of New Tab Page chrome extensions like window 8 Metro Tab tiles, Modern New Tab Page. 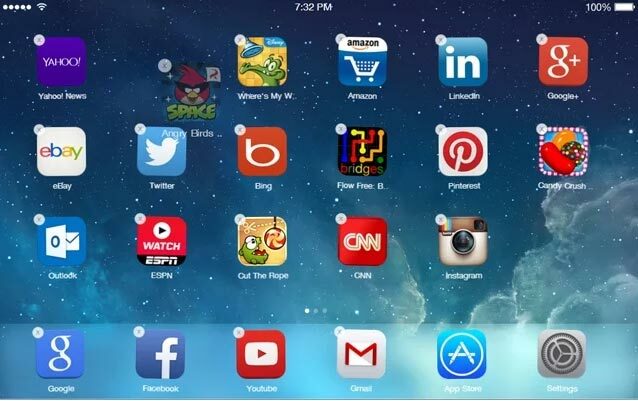 Now, We are going to introduce the iOS 7 New Tab Page which brings you the iPhone to your Google chrome. iOS 7 is the latest version for the Apple users which got the flat user interface and plenty of overhauls compare to the previous iOS versions. This iOS 7 New Tab Page Chrome extension brings the all new features, styles, iOS 7 Wallpapers and iOS Games to the Google Chrome with a single click. After the installation, you will certainly feel the iPad look in the Google chrome New tab Page. Go to full screen mode to experience the iOS 7 user interface with beautiful style and design. Also, you can access the many apps, App store and extension settings in the same page. The Multiple screens offer the new range of apps that are not available in the Google chrome. You can also access games, social networks and most popular sites around the world directly from the iOS New Tab Page. iOS 7 Home offers a lot of customization’s and settings, you can explore IOS 7 home settings by clicking on the settings icon and from the settings new window you can change wallpaper, export and import settings, moreover you can add any website you want to your iOS 7 Home. iOS 7 New Tab Page App store offers a wide range of apps, Games in different categories. In the App Store, You can find many popular websites, Games, News, Social media and more. Just click the install button to install any apps from the iOS 7 New Tab App Store. In addition, you can also install Chrome Apps from the Web store by accessing the Chrome Apps Category. In the settings page, you can change the iOS 7 Screen Wallpapers and export the settings for later use. 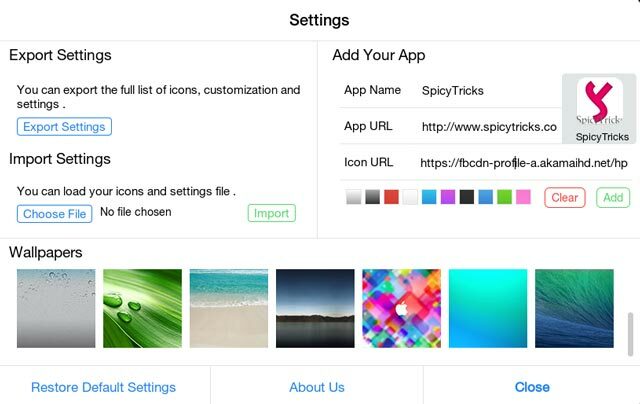 Also, you can create your own app in the settings page.